There are two options: point the primary domain, or point a subdomain such as blog.example.com. The following instructions show you how to point your site 'example.com' to CargoCollective. The screenshots below use the domain example.com. Your domain will appear instead when following these instructions. 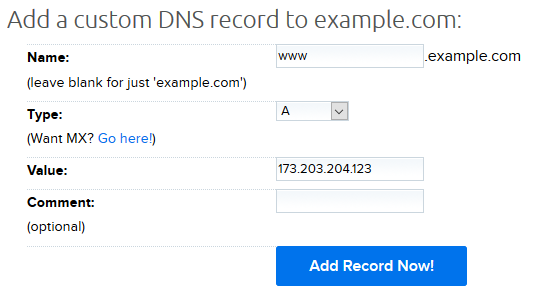 In your DreamHost panel, create an A record for your domain. Save this record by clicking the blue Add Record Now! button. Repeat this step for the 'www' A record. Your site is now pointed to CargoCollective. Due to DNS propagation, it can take several hours for the records to update online. 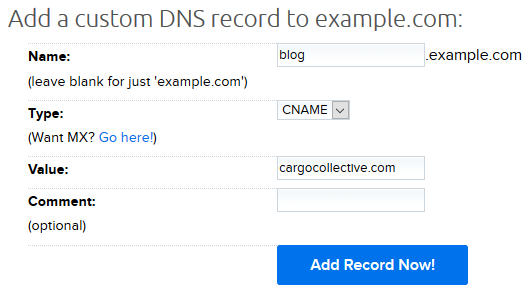 The following instructions show you how to point your site 'blog.example.com' to CargoCollective using a subdomain. Your subdomain is now pointed to CargoCollective. 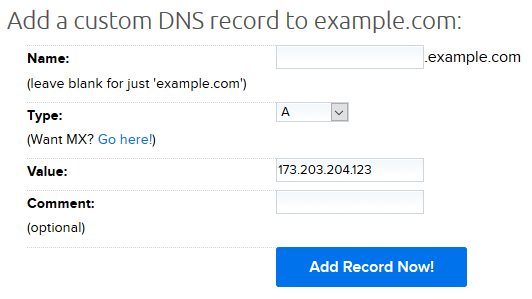 Due to DNS propagation, it can take several hours for the records to update online.